Fitting informative content into 140 characters or less is where most business people struggle with Twitter. Fortunately, Twitter has tools that make linking to other content a breeze. All you need to do is think up a short but descriptive headline with keywords and insert your link or other content. Got a great resource on 5 Things Facility Managers Need to Know to Use Spot Coolers? Super! Just type a quick headline and link to the resource right from the tweet. This is a great way to share helpful information with your followers and generate traffic to your website. Here's a sample of helpful tips that may be useful to a facility manager and they can even click on the link to get to the resource. Creating informative tweets is only half of the benefits of tweeting. 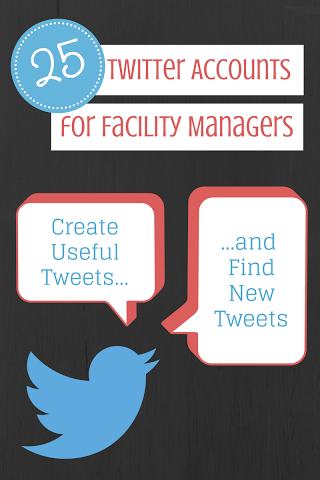 Following accounts of others in the facility management field fills your Twitter feed with useful information. Here are 25 Twitter accounts -- in no particular order -- to follow for the Facility Management Industry. Stay informed and follow these industry thought leaders. Get started connecting and creating some useful and informative tweets. Today’s Facility Mgr @TFMTweets -- Since 1988, Today’s Facility Manager has been keeping facility management professionals up-to-date on the latest practices, products, and services in the field. ThinkFM @ThinkFM -- The leading conference for facilities management professionals. Global FM @WorldFMDay -- A worldwide federation of member organizations committed to providing leadership in the facilities management profession. IFMA Capital Chapter @IFMAcap -- The premier professional association for facility management with over 900 members, the IFMA Capital Chapter is the largest chapter supporting FM professionals. BIFM Awards @BIFMAwards -- The biggest & most prestigious networking event in the facilities management calendar. Bellrock FM @BellrockFM -- They provide property and facilities management solutions for retail, healthcare, education, hospitality, and corporate clients. FacilitiesManagement @FacilityMngmnt -- An event for the Commercial Facilities Management and Construction Industries, with a unique one-on-one format. FM World @FM_World -- FM World is the magazine of the British Institute of Facilities Management. FacilitiesToday @INTO_FM -- Facilities Management Industry Today shares FM news and resources. IFMA @IFMA -- The world's largest and most widely recognized international association for professional facility managers. iOffice, Inc. @iOfficeCorp -- iOffice IWMS & CAFM Software is the smarter solution for office and facilities management. Harold (Hal) Good @Hal_Good -- Procurement professional AEC public-private partnerships. Martin Pickard @thefmguru -- Principal of FM Guru Training and Consultancy providing advice, support and inspiration to those involved with the management of facilities. NFMT Facilities Expo @nfmt_conference -- Where facility professionals come to learn. FMAdvisors @FMAdvisors -- They improve business performance within REFM and Facility Service industries through refined business solutions, innovative technology and in-depth market research. Critical Facilities @CFSummit -- The only event for mission critical facilities, design, construction and management. Buildings @BuildingsMedia -- Tweets from the official BUILDINGS Magazine account. FMD Magazine @Maintenance_Mag -- The top resource for maintenance and engineering managers. VFA, Inc. @VFAINC -- VFA is the leading provider of end-to-end solutions for facilities capital planning and asset management. ONE FACILITY @ONEFACILITY1 -- Tweeting advice on business refrigeration and air conditioning and other cool facilities management stuff. Tomorrow’s FM @TomorrowsFM -- With all the latest news stories and unique features to your desktop, tablet or smartphone, Tomorrow's FM is your online facilities management magazine. FMJ @fmjtoday -- A monthly magazine providing industry-specific intelligence to facility management and property professionals in the private and public sectors. FMJ @TheFMJ -- IMFA’s official magazine written for and by facilities management professionals who develop and maintain productive workplaces and shape the future of the built environment. EFMC Conference @EFMC_conference -- With more than 700 delegates, EFMC is the most significant information and networking event for European and International facilities management professionals. Are there accounts that you think should be on this list? Comment below and include their Twitter handle! And while you're looking for useful information to help manage your facilities, go ahead and download this quick check list so the next time you have a planned or emergency air conditioning outage you'll know what to do.